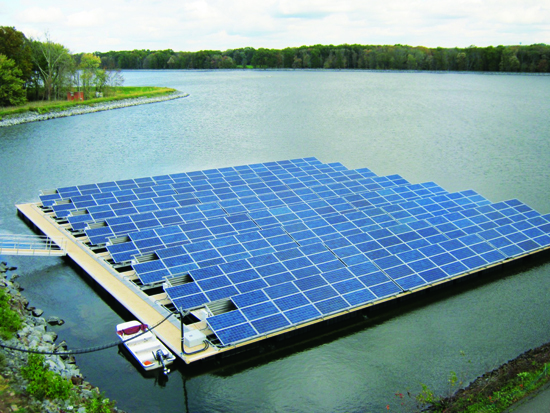 Solar energy solutions built on floating platforms have several advantages, both financial and environmental. Any floating platform needs a safe and reliable mooring solution. SEAFLEX has already been used to moor several of the early adaptations of this application. Solar energy is a clean and renewable alternative to fossil fuels, and floating solar provides even more benefits to resource intensive industries. With increasing interest in floating solar, also known as floating PV (photovoltaic) or FPV, studies have started emerging where the benefits of installing PV systems on water instead of land are examined. We now know there are several benefits, both financial and environmental, some of which can give floating solar plants a big advantage over land-based alternatives. We have also been able to show that using SEAFLEX to moor FPV installations can increase cost efficiency and decrease maintenance need. The biggest difference when installing a land-based PV system compared to a floating PV system is the need to find a good mooring system to secure the floating panels, or the structure they are placed on. This is where SEAFLEX comes in. We do not supply the solar panels, but the mooring is almost equally important to ensure longevity, security and efficiency of the FPV system. Due to the importance of maintaining a high uptime for these panels, unnecessary repairs and replacements of the moorings can be a deterrent for some would-be investors. By using SEAFLEX, the panels can be moored safely and fast, and any inspections or repairs are much easier to perform than with traditional mooring solutions such as chains. A correctly dimensioned and installed SEAFLEX mooring system can maintain full functionality for more than 30 years with minimal maintenance. Since a completed installation is expected to last several decades, it makes sense to go with the mooring option that matches that longevity. In many cases FPV systems are installed in locations that are either exposed to storms – due to large open areas – or affected be large water level variations, such as water reservoirs and dams. In these cases, it’s often impossible to use these older mooring methods, where piles would need to be too long to manage, both when it comes to transporting and installing, and chains would simply be too heavy. Large variations in water level always means that the floating application will move as chains start to slack when the water level drops. In dams that can experience rapid variations of tens of meters, any floating application secured with chains would start moving, possibly endangering the entire system. Any FPV system that is installed in areas that experience full “winterization” (i.e. water freezing, sub-zero temperatures) also needs to consider the mooring system used and how it handles winter conditions. Canoe Brook in New York is a good example where SEAFLEX was used, and the installation has been proven to withstand a full winterization as well as the strike of Hurricane Irene, the worst hurricane hitting New York since 1972. SEAFLEX can be dimensioned and designed to withstand extreme surrounding conditions, no matter if it’s hurricane-strength winds, huge variations in water levels, waves, or currents. We also pride ourselves with being one of the most environmentally friendly options in the market. Read more about the benefits of SEAFLEX here. The benefits of floating PV systems come mainly in the form of increased generating efficiency. A study has found that the natural cooling effect of the water beneath the solar cells makes them up to 11% more efficient than solar panels placed on land. In many cases, floating PV systems are installed on dams, water reservoirs and other unused areas of water, converting these unused spaces into profitable areas while preserving valuable land for agriculture or other uses. It is also easier to place the installations close to existing roads and nearby electrical infrastructures. Furthermore, placing the PV system on water can make a big difference in longevity and maintenance costs. “Soiling” – the issue with wind blowing dirt or sand up onto panels – can be a serious problem, leading to as much as $0.3/kWh of energy loss. Add to this the cost of continuously cleaning the panels from this dirt and the costs begin to add up. While floating PV systems are not immune to blowing dirt and dust particles, they are generally not as exposed as land-based alternatives. Finally, when deciding on whether to install a PV system on land or water, the risk of destruction due to wildlife, storms, earthquakes and even sabotage must be taken into consideration. Securing your floating PV system with SEAFLEX ensures that the solar plant will survive even the harshest conditions. The video below, taken in August 2018, shows Typhoon Soulik arriving at a solar plant in the Sujang Reservoir, South Korea. The wind recorded is 32 m/s, but we have had several floating solar installations handling wind surges of 40 m/s or more! Opting for a floating solution generally has either a neutral or positive environmental impact. The positive environmental benefits are many. For example, any platform floating on the water creates a shadow effect and thereby reduces the heating and consequential evaporation of the water. This is of course of highest importance in irrigation dams and similar locations, where the water can be kept in the dam rather than evaporating into the air. The added shade also improves the water quality by reducing algae bloom in the vicinity. It has even been shown that floating solar PV systems can limit erosion of reservoir embankments by reducing wave action. In a report released by Wood Mackenzie (previously Greentech Media), the leading market analysis and advisory firm on the transformation of the global electricity industry, the future for FPV system looks extremely promising. Floating solar has been around since around 2005, but has up until recently not been profitable, or in many cases even affordable. Between 2009 and 2017, the price per Watt when using solar panels has dropped from $2.60/W to $0.40/W, an almost 85% drop in price. 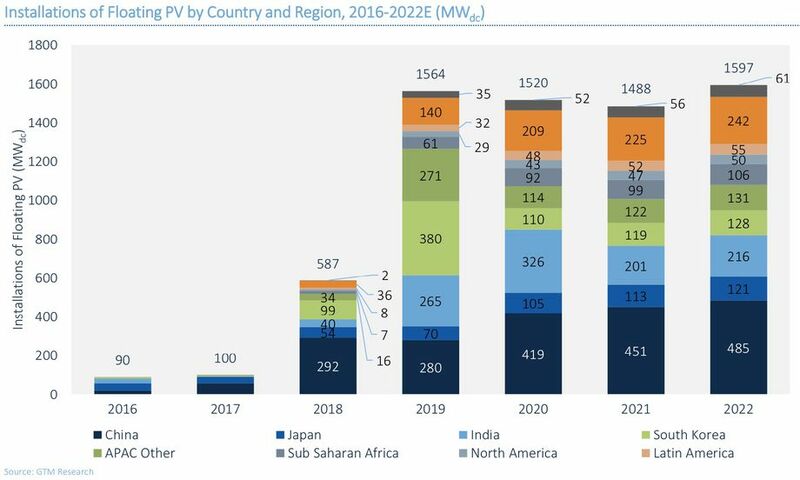 The largest market growth for floating PV is expected to take place in Asia, according to Wood Mackenzie who have created a prognosis for the next 5 years. If you are considering installing a FPV system or want to know more about floating solar and how SEAFLEX can be used, please fill out the form below and we will get back to you within one business day.